Even if your not a children's performer this is still the ideal close up effect to carry with you. "Burger-ler Bunnies" is not only a very appealing effect for the younger ones, it is also a devastatingly fooling effect for the adults too. You begin by stating that most magicians own a magic rabbit at some point in their life however there aren't many who own four! Suiting actions with words you remove a packet of four cards from your pocket each of which has a white rabbit printed upon it wearing a colored bow tie. You claim that these rabbits are very hungry and so you have also brought along some rabbit food for them. You remove another card from your wallet upon which is printed the words "Rabbit Food" you question the audience as to which food they believe rabbits like best. Despite their answer you flip over the card revealing a pile of cheese burgers. When the laughter has settled you request that an audience member keep tight a hold of the burgers until the rabbits have performed for them. 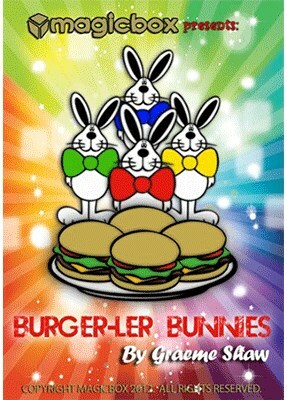 Rather than performing an effect it appears that each of the rabbits is a little mischievous as they each in turn, keep turning around to look at the burgers. After a little byplay the rabbits not only change color from white to brown but one even jumps magically from your pocket and back into your hand. Since the rabbits have been so clever you request that the spectator finally allow them to each the food. Upon flipping over the card over it is found that all of the burgers have been eaten leaving only a plate of crumbs behind. The magician hopes that the rabbits haven't eaten the burgers as they are allergic to the tomatoes in them. The magicians worst fears are confirmed when the rabbit cards are flipped over and each has become a different color of the rainbow! High quality durable plastic card stock will last a lifetime. Comes complete with plastic card wallet to house the cards.